Heat gas or charcoal grill. Cut 4 (18x8-inch) sheets of heavy-duty foil. Spray with cooking spray. In large bowl, mix melted butter, dill weed, salt and pepper. 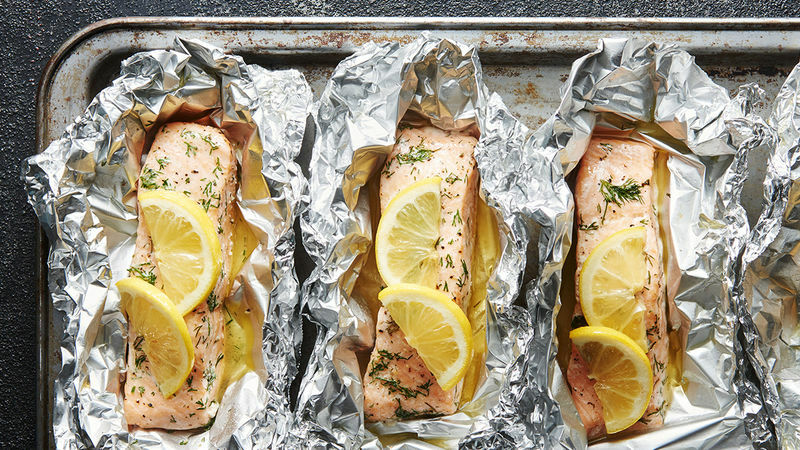 Add salmon and turn to coat; place 1 fillet on centre of each sheet of foil. Cut a lemon slice in half, and place on top of each fillet. Place packs on grill over medium heat. Cover grill; cook 6 minutes. Rotate packs 1/2 turn; cook 3 to 5 minutes longer or until salmon flakes easily with fork. Remove packs from grill; cut large X across top of each pack. Carefully fold back foil. Play around with different herbs. For example, instead of dill, use 1 teaspoon chopped fresh thyme leaves. Any type of salmon will do, but milder Atlantic salmon is a perfect match for the delicate lemon and herb flavours in this recipe.